When this book came up on my library holds list, I jumped into reading it, not knowing what to expect. Reading about an alternative reality where all kinds of fantasy creatures were part of everyday life was so much fun! I read this one as an e-book. My Diary from the Edge of the World was written by Jodi Lynn Anderson and published by Aladdin, an imprint of Simon & Schuster Children’s Publishing, in 2015. I don’t think I’ve ever read a story quite like this before – it was quirky and fun, though at times evoked a lot of emotion. It was fun to be on a road trip with Gracie and her family as they tried to save her brother Sam’s life. I really enjoyed being immersed in an alternative world filled with magical and imaginary creatures that were part of everyday life and history, like yetis that live up in Canada and mermaids that lurk in the ocean. It was fun to encounter concepts like quantum physics, superstrings and entropy while I was reading. 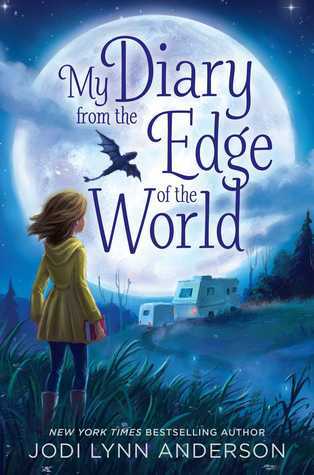 For writers, this is a good example of a middle grade novel written in a diary format. It’s also an interesting example of world-building, where fantasy creatures and places are blended into the world the way it exists now. Jodi traveled to different places around the world as she was growing up. She worked as a book editor before she became an author. Have students write one or more diary entries about an incident in an alternative reality of their choice. Create a fantastical creature that could inhabit this world and write a news story describing the historical event that your creature had an effect on. Sounds like a story I'd like. And I love the cover. That's the first time I've heard of a fantasy novel written like a journal. It sounds like an interesting read. Dystopian/magical worlds can be such an escape. Am interested in the authors writing style. Love that cover. I have seen this one here and there, but never really knew much about it beyond the cover. Thanks for your insights and I've added it to my books to read. New title to me. Sounds fascinating. I will check it out. I'd heard of this book, but, like Greg, hadn't known much about it. What an unusual premise. I love the idea of sasquatches helping to win the Civil War!